Lifestyle habits can cause stains to build up up on the outside of the teeth and make them look darker than they once were. This product may make your teeth appear whiter, by removing surface stains. It will not change the natural colour of your teeth in the same way that professional whitening / bleaching can. If you would like to understand the real differences between stain removal and cosmetic teeth whitening then you should check out our article to learn the best whitening methods for you. Further information and supporting content can be found by visiting our tooth whitening hub. We understand you want whiter teeth, but this might not be the right product for you. Tooth whitening is a complex process and every person’s circumstances and results are different (although the adverts and claims from many manufacturers don't make this clear). This product may work to remove surface stains from your teeth, but it will not change the natural colour of your teeth in the same way that professional whitening / bleaching will. There is a general misunderstanding of how whitening products work, which is why we've covered the topic in detail. Some products, such as the one being reviewed here, remove stains. This is not the same as professional bleaching carried out by a dentist, and this is where much of the confusion stems from. Before choosing a product or procedure, it’s important to understand the basics. This small investment of time will save you money and improve your oral health. Whether opting for a stain removal product or professional bleaching, there are cost-effective options available, which we cover throughout our content. If you're interested in whitening, our overall advice is to visit the dentist before using a whitening product, but you can find a more detailed explanation of this by reading the links shared above. Our lifestyles, genetics and medical conditions all have an influence on our teeth. Some people have heavily stained teeth, whilst others do not. Opalescence whitening toothpaste works by removing surface stains and may make your teeth appear whiter, but it will not change the natural colour of your teeth. The results you achieve by using Opalescence will be different to me. I have tried many different products and have little to no staining on my teeth. Because of these circumstances, it would therefore be inaccurate to show before and after images to suggest what results you might get, because simply put, your before and after results may be very different. However, to give you an idea, visit our teeth whitening before and after page, and you can see the kind of results you can expect from a stain removal product such as this, and the results you can expect from professional bleaching. A tube of Opalescence Whitening toothpaste will cost around £10 and will last for about 3-4 months. Compared to more conventional tubes of toothpaste, prices at around £2-4 per tube, this does appear expensive. Many whitening toothpastes are similarly priced, so at £10, although more expensive, it is not overpriced. Depending upon your location will to some extent depend on where you can purchase this toothpaste. It is more readily available in the USA, with the opportunity to purchase directly from Opalescence. For UK customers the best outlet is Amazon. But you can obtain from other specialist retailers like Dental Products online. You are very unlikely to find this in any high street stores. Opalescence is a US brand that centres its product range around tooth whitening. They have a series of products to suit different users needs and the whitening toothpaste that I am reviewing here is part of the after-care range which is designed to compliment the other whitening products that they offer. Although this is part of the after-care range, there is no requirement for you to have used any other Opalescence product. Many of us dream of having lovely white teeth. With whiter teeth you often feel more confident, you smile more and tend to show more of your personality. Whitening toothpastes such as Opalescence might be one step on your journey to achieving this, but it might not necessarily be the best option. It is important that I am frank with you. Yes, this toothpaste can appear to achieve whiter teeth for some, but the reality is that many will not see the benefits and colour improvement they might have hoped for. This is because whitening toothpaste removes surface staining only. The external enamel layer of your tooth can over time become stained and dull in comparison to your natural tooth colour. A whitening paste can lift this staining and discolouration, making the teeth appear whiter, but they are not technically whiter, it is just that your natural enamel colour has been restored. Everyone’s teeth are different and this means the results are different also. A smoker of 20 years with a coffee habit will likely see more stain removal than someone who forgoes tea and coffee. Opalescence suggests that teeth can be made up to two shades whiter in just one month, but no all will see this change. Only cosmetic teeth whitening carried out by a registered dental professional will guarantee a colour change of your teeth. Really, the best way of thinking of a ‘whitening’ toothpaste is just as a really good tooth cleaner. Once you obtain our tube of toothpaste, you should really, on the whole, be impressed with the overall experience. The packaging is smart and informative. There are no ridiculous claims of what it can do for you and I did not feel that most of the money had been spent on packaging just to look appealing, although it is rather smart. One of the first things I noticed was that the tube had a flip lid. Hurrah, I can’t tell you how such a simple flip lid is to me, a massive bonus over the traditional screw caps found on many pastes. Not only is the paste easier to access one handed with a flip lid, but it also stands upright nicely. You do have to remove the cap the first time you use it as there is a seal over the end of the tube for freshness. The tube is also a good size at 133g or 4.7oz. Most tubes of paste specifically designed to whiten teeth are smaller at around 75g. Using a pea sized amount of paste each time, this tube should easily last 3 months, if not longer. As a result, you get a bit more value for the price you pay. At £10 or thereabouts per tube (view on Amazon), some would argue this is very expensive compared to a conventional paste which is £2-4 on average per tube. The paste itself is a green colour and has a mild mint flavour. By no means is it strong, in fact, I would agree with the ‘cool mint’ flavour that they class it as. I liked the taste and freshness. For me, this lasted approximately an hour after cleaning. It probably had a longer lasting effect on my breath, but after about an hour I could no longer really taste the freshness myself. I have used others that appear to have lasted longer. Unlike some toothpaste, the paste itself is not speckled with nor does not feel or taste abrasive. With some pastes like Oral-B 3D White Luxe Perfection, you can see and feel the abrasive grain and texture, not with Opalescence. The Relative Dentin Abrasion (RDA) scale measures how abrasive a paste is. Opalescence is rated at just 90 compared to some other pastes from leading brands which are double this. The higher the rating, the more abrasive the toothpaste which causes tooth sensitivity. Toothpastes with a higher RDA rating may damage your enamel, decrease the luster of restorations, and may not be safe for everyday use. 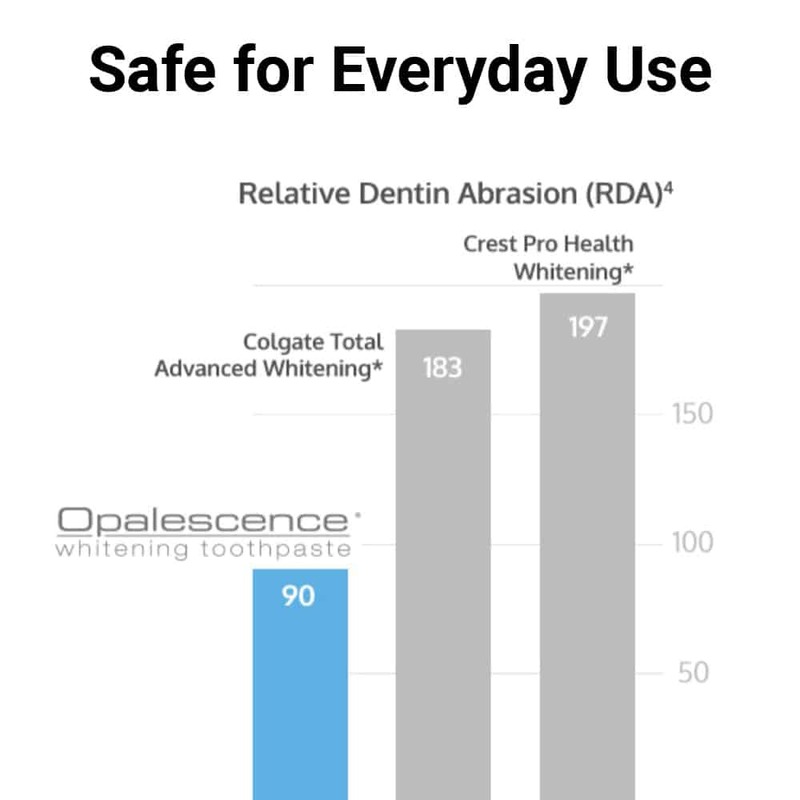 Opalescence Whitening Toothpaste has a lower abrasiveness than other leading whitening toothpastes, although products like UltraDEX whitening toothpaste is even less abrasive and could potentially deliver the same results. Our in-house dentists suggest using an abrasive whitening paste for no more than about 2 weeks on average, before returning to a more gentle paste. Whilst there is a lot of logic as well as evidence to confirm that a more abrasive paste can remove surface stains quicker, the reality is that when faced with different peoples teeth, diets and lifestyles the results are not always so clear cut. SuperShoppers is a TV programme here in the UK and in a recent episode (highlighted in this article) they found that the amount of stains removed by whitening pastes were not much higher than that of a regular tube of toothpaste. Essentially saying, that you might as well stick to a regular paste rather than worrying about these more premium whitening ones. Despite what some may think, there is no benefit to a toothpaste that actually froths, it is an artificial effect which serves no purpose when it comes to cleaning other than making you think it is doing something. Opalescence did not froth all that much and at no point did I not like the taste or feel any side effects from using the paste. If you do, stop using and consult a medical professional. As I mentioned earlier, this pastes achieves whiter teeth by effectively removing stains rather than bleaching the teeth a different colour. There are no peroxides in this paste. Certified Kosher and Gluten free this toothpaste is suitable for some users that might otherwise have to stay away from some types of toothpaste. Sodium Fluoride 0.25%w/w (Anticavity) Glycerin, Water (aqua), Silica, Sorbitol, Xylitol, Flavor (aroma), Poloxamer, Sodium Lauryl Sulfate, Carbomer, FD&C Blue#1 (Cl 42090), FD&C Yellow#5 (Cl 19140), Sodium Benzoate, Sodium Hydroxide, Sparkle (Cl 77019, Cl 77891), Sucralose, Xanthan Gum. This paste does contain Sodium Lauryl Sulphate (SLS) (more information) and CI 77891, otherwise known as Titanium Dioxide (more information) which are potentially contentious inclusions for some because of possible negative impacts on human health and the environment. Both ingredients have been used in cosmetic products for years. Many whitening toothpastes from other brands use them also. It will be a personal opinion if you wish to avoid these as a result of their inclusion. I have no immediate safety concerns with using this paste. Of course, you should check the ingredients list in case you have any alergies or known intollerances to such. Even if you believe you are safe to use the paste, if at any point you notice any abnormalities or extra sensitivity from using a different toothpaste you should stop using, and consult your dentist. As mentioned in the ingredients section above, you may not like this toothpaste because of the SLS and Titanium Dioxide inclusion. I am not here to say whether they are good or bad for you, that is for you to decide based on the data available. Lastly, Opalesence says their toothpaste is safe for everyday use. It is certainly at the lower end of the abrasivity scale and many people use more abrasive pastes on a daily basis. However, there are less abrasive options available, and our in-house dentists do suggest limiting usage to just 2 weeks at a time if you can. This toothpaste and most others are not designed to be eco-friendly. This is not a criticism as such, but the tubes in which they come provided can be difficult to recycle and often end up in landfill or being incinerated which is not great for the environment. Some people buy products not knowing or understanding whether they are any good prior to purchase and can end up wasting their money, but throwing it out in the trash because it hasn’t done the job or they didn’t like the taste. By reading this review you are gaining insight and reducing the chances of impacting the environment as a result. Opalescence make a number of other whitening products. They are one of several companies who actually manufacture the whitening gels that contain the peroxides that can change the natural colour of your tooth. In addition to the toothpaste being reviewed here, they offer a ‘Ready To Go’ and ‘Take Home’ kits which helps keep the teeth white by removing stains and is designed as a follow up option to custom tray/in office tooth whitening. These are dispensed by a registered professional and can’t just be bought direct from the shop shelf. This is the same for the gels. They are not available to buy over the counter and can only be dispensed by registered dental professionals here in the UK. Opalesence is better known and more readily available in the USA and some other countries around the world and the way the product is dispensed may be different due to laws in other countries. I don’t think it is necessary to call out Opalescence for anything in particular. I can’t say they have made claims or suggestions that are outlandish and on the whole, they are quite upfront about their product, with clear information about the RDA score etc. However, an improvement Opalescence, other leading brands and the tooth whitening industry as a whole need to make is being more transparent about how tooth whitening works and how so-called whitening toothpastes are only lifting stains, they are making the teeth appear whiter, but they are not actually changing the baseline colour of the teeth. A bit more patient/consumer education could go a long way in my opinion. As we’ve mentioned in the results section, it’s difficult for us (or anybody else) to systematically test numerous whitening products. For this reason, we have chosen to omit star ratings. However, below you can find a summary of our closing thoughts. With an RDA score of less than 100, this is one of the not so abrasive whitening toothpastes on the market. Whilst it is too not exactly cheap, you are getting a bigger tube of paste in comparison to most alternative options, thus a little extra value. Smartly packaged, it is made by a well known brand and one that offers lots of whitening products. It is only ever going to remove surface stains, which will make teeth appear whiter for some, but it is not a permanent answer and will not whiten teeth for all (those with no stains). Where can I buy Opalescence Whitening Toothpaste? As you will unlikely find it in your local chemist, for UK readers we suggest heading to Amazon or purchasing through another specialist provider online. USA based customers can purchase direct. It has cool mint flavour which does not last or as long as I would like post clean. Freshness for me lasted about an hour. I had no sensitivity, pain or side effects from using this paste, should you should gain additional sensitivity or side effects as a result of using it, stop doing so and consult a dentist. Approximately 3-4 months based on 2 pea sized amounts being used each day. Do you own or have you used the Opalescence whitening toothpaste? Are there certain things that you really like or dislike? Let me and other readers of this article know what you think, by commenting below. Your feedback and opinions are incredibly valuable. Brilliant and very informative review. Thanks for giving very detailed feedback as I’m just about to purchase this toothpaste to give it a go.